Probot A robot which automatically probes for landmines. This page briefly describes research work done in 1997 in the Computer Vision and Robotics Research Group of the Department of Computer Science in Trinity College Dublin on the problem of the automatic detection of anti-personnel landmines. Basically we were trying to emulate human deminers because they are very good at the job! 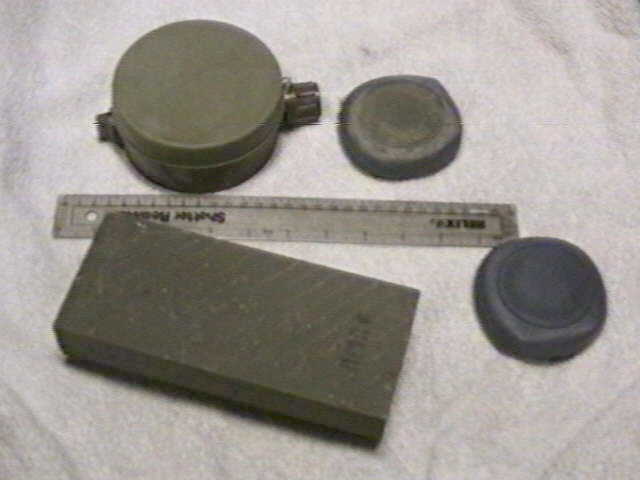 On the left you can see a number of anti-personnel landmines and on the right a manual probe which is not far removed from a sharpened stick. Human deminers insert this into the ground at an angle less than 40 degees in order to hit the side of a mine (which should not initiate the mine). They do this roughly every 2cm which (needless to remark) is an incredibly tiring and dangerous task. Nobody has automated this task yet (as far as we can tell) although we're not the only ones working on it. It seems though that the most important part of this work is to let people know of the concept (as it is quite simple and yet we believe it has significant potential to solve the problem) so we've tried to get the word out. Note that on this page you can click on most of the images to get higher resolution versions. We have assembled a lab prototype (as shown of the left) using on an XY table for the motion (rather than a mobile platform for the simple reason that we had an XY table available! ), together with a linear actuator, a force sensor and a sharpened steel rod. This is a concept prototype intended simply to demonstrate the feasibility of automatic probing. We have been using this device to repeatedly probe a test area (as shown on the right). 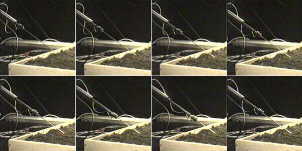 Click here for an AVI movie (c. 3 Megs) of the probe being inserted into the ground. 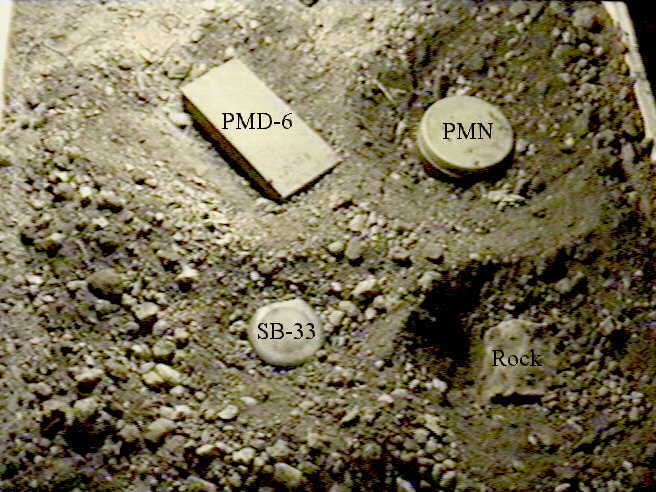 Probing was done on an area of 50cm x 50cm, and in that test area a number of 'objects' were buried (See picture on the left). Probot inserted the probe according to a simple search algorithm which does a higher resolution search if an obstacle is encountered. 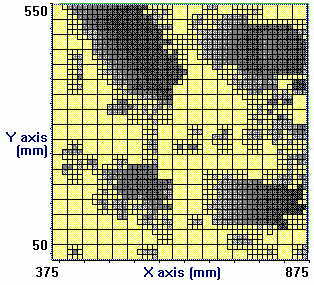 The resultant probe depths are shown on the right , where yellow represents no obstacle and the grey levels shown correspond to the depth to at which an obstacle was encountered (i.e. the darker it is, the closer to the surface it was found). It is also essential to note that in reality only the leading edge of the objects would be probed! It is not healthy to probe on top of a landmine! As probing was done at an angle of 30 degrees, the depth data is not in a Cartesian frame. Transforming it we can get some idea of how things look in 3-D . 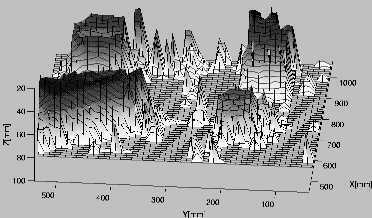 Note that this 3-D view is taken from the direction of probing (which was parallel to the X axis). The data from this test shows that the major obstacles were all clearly determined along with a number of small stones. Although all our tests to date have been lab-based (i.e. not out in the field) we do believe that this experiment has effectively proven that the probing process can be automated. At the same time a number of problems and future issues were identified and these will be documented in a paper which will be available here at some time in the very near future (hopefully within a week). These include sources of noise for the position information, problems for classification of the buried objects and potential disturbance of the objects due to probing. Anyhow hopefully someone with the capability to develop robust and reliable robots for use in the field will now take this idea and build a working humanitarian demining robot. 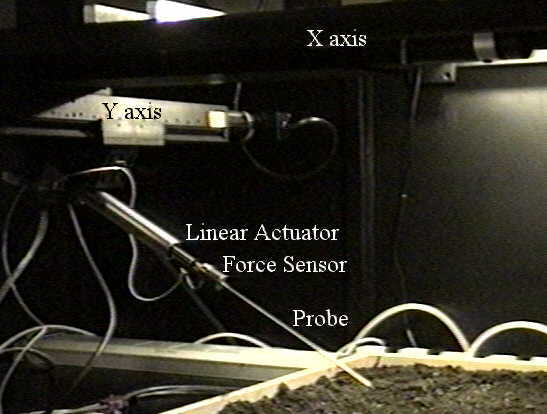 The device on the left is a very simple version of an autonomous probing robot (which consists of a probe that is driven into the ground using an actuator with force and position sensing which is mounted on a linear stage which is in turn mounted on a mobile platform. This is almost definitely too simple (i.e. not capable of fully solving the problem), but there are many other possibilities such as a a robot equiped with an array of independent probes (to speed up the probing task), or a robot with a flexible arm equiped with a metal detector, a probe, and perhaps even a chemical detector. Other tools could be added to these devices to mark possible mines (e.g. with a paint marking system) and to remove or destroy the mines. Other designs have been developed elsewhere. Some History - Manual testing. Initially we performed tests using a specially designed manual probe (shown) and the results from these tests were positive enough to keep us going. The results are described in our SIRS paper and in more detail in an internal technical report. "The detection of buried landmines using probing robots", Kenneth M. Dawson-Howe and Tomos G. Williams, Robotics and Autonomous Systems Vol.23, No.4, July 1998, pp.235-243..
"Automating the Probing Process", Kenneth M. Dawson-Howe and Tomos G. Williams, in, Sustainable Humanitarian Demining: Trends, Techniques and Technologies, D. Barlow et al. (editors) Chapter 4, Humanitarian Demining Information Center, James Madison University, 1997, pp.265-270. "Automating the Probing Process", Kenneth M. Dawson-Howe and Tomos G. Williams, Proceeding of the International Workshop of Sustainable Humanitarian Demining, Zagreb, Croatia, 29th September-1st October 1997, pp.4.24-4.29. "Autonomous Probing Robots for the detection of abandoned landmines", Kenneth M. Dawson-Howe and Tomos G. Williams, Proceedings of the 5th Symposium on Intelligent Robotics Systems (SIRS-97), Stockholm, Sweden, 8-11th July 1997, pp.51-58..
"Hand-Held Force Probing Experiment", Tomos G. Williams and Kenneth M. Dawson-Howe, Internal Technical Report, Dept. of Computer Science, Trinity College, Dublin 2, Ireland. May 1997. United Nations Demining Site has lots information/reports and other links. International Committee of the Red Cross (ICRC) has lots of information about the problem along with a campaign to have anti-personnel landmines banned. U.S. Department of Defense (DoD) Humanitarian Demining Research and Development programme has lots of information and a comprehensive research programme. This work was supported by the SMART II (Semi-autonomous Monitoring and Robotics Technology) TMR research network (E.U. contract FMRX-CT96-0052). Also thanks are due to Commandant Jim Burke and Captain Aidan Dempsey from the School of Military Engineering in the Irish Defence Forces.